Some things have changed in the nearly four years since AJ Brockman opened The Brewhouse Gallery in a struggling Lake Park strip mall. This taproom and culture hub expanded into the adjoining storefront. 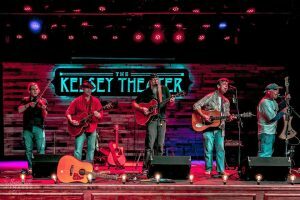 It got a companion venue in The Kelsey Theater, a concert hall that Brockman and his team opened in year two of their mall makeover. They also acquired the mall, becoming landlords. Tenants today include a tattoo parlor, a belly dancing school and a restaurant, Brick & Barrel, that Brockman especially likes for its craft cocktails — “one of the best Old Fashioneds I’ve ever had,” he tells PureHoney. 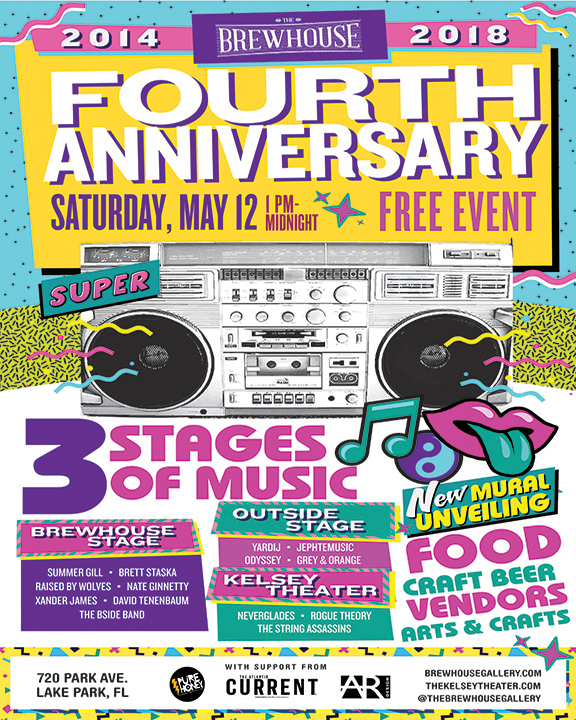 This artist and entrepreneur has plenty to toast as he prepares to celebrate another Brewhouse anniversary with a block party that is fast becoming a mainstay of the region’s regular music calendar. Rogue Theory, String Assassins and a dozen other acts are already scheduled for the May 12 birthday bash. “We took over the whole plaza and we’re trying to cultivate a whole arts district,” says Brockman. And if the site of this unexpected renaissance was all but invisible before, it’s impossible to miss now, with a painted mural stretching 900 feet along the complex’s back wall. “It really just livens up the whole area and really does scream ‘arts district,’ ” Brockman says. In this respect, not a thing has changed. Brewhouse is still a gallery, first. Artists show affordable works to potential buyers who also get to enjoy live music and craft beer. “The music and the beer is what brings people in,” Brockman says. Beer sales help him recoup what he gives up by charging artists for display space instead of the traditional, hefty gallery owner- commission. Artists in turn keep more of what they earn, he says.